Among the topics covered by the partners along the project, can be found: Biomass, thermal and photovoltaic solar energy, wind power, geothermal resources management etc. In CARTIF we have been mainly working on the biomass and solar cooling, topics. For this communication, we are going to focus on solar cooling, describing exclusively those actions done for the diffusion of solar cooling applications. Cooling with solar energy is an especially attractive idea if we take into account: that the cooling loads coincide with the maximum irradiance; that these utilities can use the residual thermal energy of other processes, thus increasing efficiency; and that, by combining solar heating and cooling at different times of year, the use factor and performance of the utilities can be improved. The objective of the course was training on the concepts necessary to design and setting up thermal water heating installations in general and solar water cooling installations more specifically. It was given information about different typologies of facilities, as well as about the various components of a thermal solar system. The target people in this course were design and installation engineers, technicians and professionals that were interested in this kind of technologies and in particular those who wanted to know something else about applications of solar cooling. The course was very useful for the participants. Some of them have asked for more information about this technology and are still in contact with us for any other activity related to solar cooling that we should prepare. The course was divided in two parts, one of them more general related to solar thermal systems, and a second one more specific centred in solar cooling. Topic 1: Design and calculation of installations. This topic was used as introduction for the course, showing different configurations usually adopted for thermal solar installations: Sanitary Water Heat (SWH), Radiant floor and swimming pool, and different combinations of those two. For the dimension process, three different methodologies were shown: usability method, based on the concept of critical radiation, f — chart method, for the dimension of swimming pools and finally, for radiant floor, the Degree-Day method. It was also explained the calculation of pumps, pipes and expansion vessels. At the end of this topic the students should have the skill to calculate installations as well as to apply the usability method to calculate solar cooling installations. Topic 2: Heat Transfer applied to thermal solar energy. The solar energy applications are based on the transformation of the solar radiation onto heat, and its posterior transmission to a fluid. Taking this into account, it was considered necessary to describe the basic mechanisms of heat exchange, to understand how the principal elements work: solar collectors and heat exchangers. Topic 3: Fundaments on cooling. Solar cooling consists of the production of cold using hot. In this lesson was made an introduction technological and historical of the cold production, being valid too as introduction to the solar chillers operation. There were shown resemblances and differences with respect to the conventional systems. Finally, was explained the psychometric diagram and the calculation of the impulsion temperature for an air thermal conditioner. Topic 4: Elements of solar installations. On this topic were described some characteristics of the solar thermal installations. Among other things were described the different kind of collectors, the tanks, heat exchangers, pumps, pipes, insulation, and other elements used on the installations. Topic 5: Solar cooling concepts. On this journey were briefly shown different ways to produce solar cold as well as the parameters used to characterize the installations and the most typical configurations. We began whit the description of the adsorption process, to show next the more habitual adsorbent substances. Finally are described the adsorption chillers, either with discontinuous cycle, or with recuperation or with phase change. In this lesson were described the different absorption technologies and the more frequent couples of substances. It was shown too how the working conditions affect to the performance or the power, in order to interpret their interaction with the solar installations. Topic 8: Desiccant cooling systems. On this topic, are commented the advantages of the desiccant systems, as well as the elements that form them, either solids or liquids. They are described the different configurations and how they behave against changes on the temperature of the regenerator. Topic 9: Dimensioning of solar cooling installations. On this last topic, were described different programs available for the calculation of solar cooling installations: SACE , TRNSYS  and SolAc . The course lessons were celebrated in a lecture room rented on the Engineers University (ETSII) of Valladolid — Spain (5th-9th of May). There were 17 attendants and the total length was 20 hours. Training local entrepreneurs and technicians is necessary to ensure that the system designs are appropriate to local conditions, and to ensure that traditional values and customs are built in to the business culture. Also important is the training of development workers and decision makers to help overcome the barriers to successful and widespread use of renewable energy to meet the basic needs of rural people. The training programs under this project have not effectively address these issues. Because of their significance to the overall success of an energy for sustainable development program, below is a brief comment on these training activities. Taleghan test facility site is a solar test facility site which was planned to be the first solar systems reference in Iran. This test facility site is not completed yet but some of the planned projects were completed and the others are started and the construction is in progress. There are different facilities in this site which include: Fresnel system, Dish Stirling, Solar Power Tower and Parabolic Trough collector. All these systems will be implemented as pilot projects. The Fresnel system and Parabolic Trough Collector with 5m aperture have been implemented. Some other extra solar facilities for domestic applications were designed and implemented in this site, they are: Solar Dryer, Solar Desalination and Solar Cooker. There is a 30 kW photovoltaic power plant in this site also. The photovoltaic power plant is a grid connected system which injects about 36 GWh into grid annually . A pilot solar power tower was designed for this site and will be implemented in near future. Figure 4 shows the plan of this solar power tower. The data available through these questionnaires have been used to update the existing document “Best practice regulations for solar thermal”, published by ESTIF in August 2007 . The updated document will be available on the project website, as well. A European workshop has been organised for the project partners: European experts who have been involved in existing STO implementation presented their experience, the strong point and the weak points of each STO. The most innovative outcome of the project so far is the analysis of success factors and performance indicators, which will be described in the next paragraph. The success factors and performance indicators are quite clear and almost unanimous, meaning that a good STO could be developed following these guidelines. 100-year of Sergey Korolev, 150-year of Edward Tsiolkovsky and 50-year of the first artificial Earth-satellite jubilees have stimulated us to start a new educational experimental project “Space technologies, ecology and clean energy in schools of the future” for Moscow schools in 2007. The essence of the project is to create an experimental educational platform on the basis of а number of Moscow secondary schools. We are involving schoolchildren in activity associated with high technology of real time monitoring of the Earth surface and solar energy conversion. Portable, inexpensive receivers (described in section 2.1) were installed in ten Moscow Schools designed to get and process space images of the Earth sending by satellites in real time mode. School students started getting the experience of work with the Earth surface images taken from the space under supervision of their teachers, and later on independently (Fig. 13). They are taught to bind these Earth surface images to the geographic map using specially designed algorithms. Within the project, schoolchildren also acquire basic knowledge related to renewable energy using experimental solar PV modules installed on the roof of school building (Fig. 14). Pupils monitor, in real time, solar radiation by measuring electricity generated by the solar module and compare these data with information received from satellites according to scheme at Fig.13. A new design (without EVA) of 10 W solar modules with organic-silicon polymers encapsulant (VIESH) was used for school project  (Fig.13). The size 500 х 500 mm2 is very suitable for experiments in schools. Each work group was composed by 01 professor and 04 Engineering and/or Physics students. The training course had included solar geometry concepts, solar collectors and storage tanks, small, medium and large systems functioning characteristics, attending to variable factors found at each location. With practice classes, students had learned how to use the field research Kit, composed by GPS, tape measure, compassing, turn indicator and digital cameras used to register the visited systems. All data observed were registered by filling technical and behavioral questionnaires, and by producing two sketches: architectonic and hydraulic. These sketches included verification of collectors orientation, tilt angles, array scheme and distance, main characteristics and identification — also verified for storage tanks -, accessibility and safety conditions, obstacles around solar collectors and auxiliary system’ characteristics. Figure 4 illustrates the field research. The concluded part of this project, in which three cities were studied, had summed a number of 274 visited systems, containing 4105 solar collectors. About 8777m2 of collector area were observed for a total hot water storage volume of 492m3. Also, this research had evaluated systems of different functioning period that were divided into 4 groups. This evaluation can be observed at Figure 5 for Belo Horizonte and Campinas cities. This comparative evaluation is not performed for Rio de Janeiro because there were no low — income households solar systems installed more than 5 years ago; therefore these data were not included in this analysis. The characteristic consumption of the studied buildings was estimated relating the total solar collector areas and volumes for each location. Campinas, where medium and high income households with 1 or 2 storey buildings were visited, presented an average collector area of 8m2/household, storage volume of 600 liters/household and an average hot water consumption of 150 liters/person. The average storage volume found at Belo Horizonte’s systems is 7500 liters/building, 240 liters/household and nearly 60 liters/person. This last number is considered low if compared to high-income households consumption observed at Campinas. This fact was linked to the consumption compensation between the apartments and the small available area to install solar systems that can cause reductions over the f-chart value and increase the auxiliary system consumption. Moreover, there’s a tiny use of hot water in kitchens, which can also raise significantly the systems sizing prediction. At Rio de Janeiro, the average consumption for low — income households studied is 58 liters/person. The solar collectors inspection had displayed the presence of oxidation, infiltration, painting and insulator deterioration and broken or damaged glasses. At 10 to 15 storey buildings’ systems visited, 12% presented infiltration, 10% painting deterioration and 5% oxidation, showing these three problems as the most common ones. Thus, the infiltration problem can be considered as the most critical, since, in most of the cases, it is the main actor that causes other problems, such as painting deterioration and oxidation. It is reasonable to associate those problems with low incidence of systems maintenance, proved by the great number of dirty solar collectors: nearly 30% at large and 67% at small systems for medium and high-income households. Large systems storage tanks presented good functioning, although oxidation problems were detected at the structural base: low (22%), medium (13%) and high (9%). Again, this problem can be a lack of periodic maintenance consequence. The observed results about equipments approved by INMETRO market, point to an interest growth demonstrated by specialized stores. At Rio de Janeiro nearly 45% commercialize only these products, while at Belo Horizonte this value raises up to 70%. For these stores, 80% of products have the PROCEL Stamp, which is considered the best quality product, classified as “A”. Basically, LPG gas predominates at large systems in Belo Horizonte, where 74% of them use this kind of auxiliary heating. Meanwhile, at Campinas, where small residential systems were analyzed, the electric auxiliary heating is the most used, reaching 66% of studied households. At low-income households visited at Rio de Janeiro, which integrated a special program of the electric energy company, all the auxiliary systems are electric, represented by the resistance installed into the storage tank or the electric shower. Another problem noticed is the bad conditions of systems accessibility (Figure 6). In large systems, 30% presented elevated and risky access, whereas in small systems this number corresponds to 46%. The lack of monitoring and maintenance might be associated to accessibility difficulties, since this problem obstructs the necessary equipment maintenance. It was detected a general absence of monitoring systems and consumption control of hot water and gas or electric energy. In 90% of small systems, and 71% of large ones this occurrence were presented. Preliminary data results observed in this research demonstrate the need of creation of a Solar Water Heating Systems evaluation program, through quality indicators definition. This strategy would evaluate essential aspects for proper functioning of the solar system, which include: hydraulic array, products quality, auxiliary systems, collectors’ orientation and tilt angles, shading occurrence, accessibility, safety, monitoring and system’s maintenance. At the same time, a Good Practices Manual for Solar Water Heating in Brazil should be developed, with the creation of formal training programs focused on design, installation, operation and maintenance of solar systems. This new program, along with the equipment certification, already established in Brazil, will help the Brazilian solar heating market to grow with sustainability and will contribute for its current national’s scene changing. PROGRAMA NACIONAL DE CONSERVACAO DE ENERGIA ELETRICA. “Avaliagao do Mercado de Eficiencia Energetica no Brasil: Pesquisa de Posse de Equipamentos e Habitos de Uso da Classe Residencial no Ano Base 2005”. LEITE, H. G. Consideragoes sobre amostragem. Departamento de Engenharia Florestal, Universidade Federal de Vigosa. 2004. MINGOTI, S. A.; Analise de Dados Atraves de Metodos de Estatistica Multivariada — Uma Abordagem Aplicada. Editora UFMG, Belo Horizonte, 2005. INSTITUTO NACIONAL DE METEOROLOGIA — INMET — pelo site www. inmet. gov. br acessado em junho de 2007. Cidades, Belo Horizonte — MG, pelo site www. ibge. gov. br Accessed on: Jun. 2007. • Specialized institution: Romanian Agency for Energy Conservation. • A course for in-service training of the high school teachers, in the field of sustainable energy: training methodology, integrating face-to-face training activities with ICT — based ones. This course is aimed to test parts of the training tool in the partnership, with high school — teachers groups. Also the testing of the training tool parts in the real class environment was envisaged. A specific part of the project is dedicated to evaluating, internally and externally, the project’s activities and outcomes. The teachers’ in-service training course concept is schematically presented in Figure 1. The activities during project life time are distinguished here: the evaluation of the training needs, the in-service training course curriculum design and testing (in-service training course). As a result of the in-service modules, teacher-students have to propose the implementation of the renewable energy systems subjects implementation in the real classroom environment. • A core of trainers by selecting the human resources for the project, to improve and update the existing infrastructure in the partner institutions for the optimum development of the project and to disseminate the project outcomes through the partners and attendees of the course. In a proposed directive on the promotion of the use of energy from renewable sources from the European Union , an ambitious target of 20% contribution form renewable energy is set. The current contribution of solar thermal towards the total renewable energy supply is only 32 PJ (2006 figures). This is less than 1% of the total final energy use of renewable energy and only 0.1% of the 25.000 PJ final heat demand in the EU-27 . This is still far from the potential that has been assessed by the European Solar Thermal Technology Platform (ESTTP) of 50% of the total heat demand [3,4]. For reaching the 20% target, a large growth in the use of renewable energy from the current 6% production of renewables is essential. Solar thermal can contribute to this growth, but it is essential that solar thermal heat production is included the national and European energy statistics in a proper way. The design of solar buildings calls for an augmentation in landscaping architectural design to regulate major environmental parameters within and outside the buildings. This emphasizes plantation of medicinal plants, decorative creepers, deciduous trees and flowering plants. Selection and identification of these plants are essential to thrive and to build good vegetation environment. Landscaping could be adequately designed so that wind directions are favorably altered. The deciduous plantation of trees in the southern side of the building to shade the building during summer will help the households to burn less power for cooling. During winter, when the trees shed their leaves, they would let in winter sun to keep inside warm. Environmental landscaping conserves energy, saves water, reduces pollution and economic. Conservation of water through landscaping is known as Xeriscaping achieved by choosing plants that are drought resistant and belongs to native area. The design features of modern sustainable building proved self sufficiency in meeting the requirements for leading a comfortable life in a long run. Certain concepts that are under study like utilization of rain water for power and fuel generation are not presented. It is proposed to construct and demonstrate the Universal Home soon after the validation of the results through online simulation. Studies are in progress and critical proposals are projected, for storing and harvesting the rain-water in large scale to meet the demands of scarcity of water, power and gas in multiple directions using solar radiations. We do hereby extend our gratitude to Sri A. S. Chinnaswamy Raju, President, Sri Krishnadevaraya Educational Trust, International Airport Road, NH-7; Bangalore — 562157, India for granting permission to publish this paper. We also render our regards to Dr. M. S. Indira, Principal, Sir M. Visvesvaraya Institute of Technology, International Airport Road, NH-7, Bangalore for extending the timely support and constant encouragement from time to time in achieving the results. T. Muneer, M. Asif, S. Munaww, Sustainable production of solar electricity with particular reference to the Indian economy, Renewable and Sustainable Energy Reviews 9(2005) 444-473. A. Bejan, Shape and Structure, from Engineering to Nature, Cambridge University Press, Cambridge, 2000. S. A. Kalogirou, Environmental benefits of domestic solar energy systems, Energy Conversion and Management 45(2004) 3075-3092. Y. Feng, Thermal design standards for energy efficiency of residential buildings in hot summer / cold winter zones, Energy and Buildings 36(2004)1309-1312. T. Muneer, Solar Radiation and Daylight Modes, Elsevier Butterworth- Heinemann, Oxford, 2004. R. Kumar, S. C.Kaushik, Performance evaluation of green roof and shading for thermal protection of buildings, Building and Environment 40(11) (2005) 1505-1511. Energy Conversion and Management 49 (2008) 2354-2366. J. F.Karlsson, B. Moshfegh, Energy demand and indoor climate in a low energy building — changes strategies and boundary conditions, Energy and Buildings 38 (2006) 315-326. In the north of Portugal were identified social apartments that incorporate passive solar solutions that determine an improvement of the energetic efficiency and the internal comfort conditions without increasing significantly the construction costs . Fig. 12. Social buildings: Vila do Conde and Vila Nova de Famalicao. For Lisbon area, an example of the existent asymmetries in Portugal, between the littoral and inland and urban and rural areas, was undertaken a survey in the oriental area because, since the sixties until now were built flats with social purposes . Fig. 13. Social buildings in Oriental area of Lisbon and thermal characterization of the external envelope. In 2007, an apartment constructed from the 2000, after the first Portuguese regulation in Portugal, was simulated with EnergyPlus and undertaken a sensitivity analysis for different insulation thicknesses, orientation, intermediate flat versus a flat with an external ceiling and effect of shading devices. Fig. 14. Internal temperature and shading device effect. 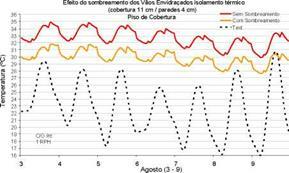 An apartment was also analyzed in terms of Energetic Certification for different the Portuguese climatic regions. It was concluded that one with glass areas facing northeast only comply the requirements for winter Portuguese regulation for the mild climate winter region (I1) and solutions with high insulation levels. For the rough winter climatic region (I3) the traditional constructive solution does not verify the Portuguese regulation even for north and south orientation. The study put on evidence the importance of the use of the solar collector for domestic hot water against the Certification, fixing all the other parameters, the solar collectors contribute always that an house from a energetic Class B become to an energetic Class A or even A+ . The network try to promote “the use of the renewable energies in the building project in dialogue with the external climatic conditions (bioclimatic buildings), in concordance with the constructive techniques and typologies of each country”. Since 2005, the beginning of the network activity, that all the participants have done a considerable effort on energetic and thermal building simulation in order to incorporate the simulation results on the real situations. The network tried always to enhance discussions of these subjects with builders, promoters and academic and technical communities. “Los Edificios Biclimaticos en los Paises de Ibero America, Gongalves. H. (ed. ), ISBN N° 972-676-200-6 . INETI, Lisboa 2005. “Los Edificios en el Futuro, Estrategias Bioclimaticas y Sustentabilid, Gongalves. H., Camelo, S. (eds. ), ISBN N°978-972-676-209-6 INETI, Lisboa 2007.E. Fchart, G. Hotwater, I. Jay, K. Load, Journal of Remarkable Solar Systems, 4 (2008) 51-58. Universidad de Catamarca — Adolfo Iriarte, Universidad Nacional de Salta — Graciela Lesino, Universidad de Tucuman — Beatriz Garzon, Universidade de Sao Paulo — Marcelo Romero, Universidade Federal Pernambuco — Ruskin Freitas, Universidad Chile — Marcelo Huenchunir e Roberto Roman, FUNDASAL — Claudia Blanco, Escola Politecnica Nacional Ecuador — Marco Yanez, CIEMAT — Maria del Rosario Heras Celemln, Jose Ferrer, Universidad Nacional Autonoma de Mexico — David Morillon, INTN (Paraguai) — Maria Emilia de Castel, Universidad Nacional de Ingenieria de Lima — Raquel Barrionuevo e Rafael Espinoza, INETI — Helder Gongalves (Coordinator) and Susana Camelo.